Today is Monday, April 8th, 2019. I’m Kevin Boyle, with your W-V-B-I Community Calendar. The B-I-C-S F-R-C robotics team B-I robot is back from the district competition in Sault Saint Marie where they were the second pick of the 2nd alliance in the playoff rounds. Unfortunately, the alliance didn’t advance beyond the first playoff rounds, but the team still came home with a coveted Motorola Quality award in hand. The award from the event judges recognized the over-all quality of their robot, but especially a hatch handling mechanism they designed and printed on their 3D printer that made them very efficient at handling hatch panels as part of the competition. They were also recognized for the quality and design of their pit displays because they promoted Beaver Island and recognized is cultural heritage. And, the Coast Guard was here this weekend breaking the ice fir the first trips of the Emerald Isle this week. Check the W-V-B-I Facebook page for some time lapse videos of that. Exercise planner for this week: Tomorrow and Thursday, Pickleball at the BIC Center from 9:30 to 11:30. Competition is heating up as some snow birds start to return to the island. And, the Arthritis Foundation Exercise Program is from 10 to 11 Tuesday and Friday in Carol’s Hangout here at the BIC Center. Saturday night, Self defense class at Peaine Township hall at 5. Meeting planner for the week is easy. Only one: BICS Board holds its regular monthly meeting this evening at 7 at school. Agenda and other details are on the school website at beaver island dot k-12 dot m-I dot u-s.
Fun planner for the week: Ladies Shuffleboard Tuesday at the Shamrock at 7. Talking Threads Quilt Guild Wednesday morning at 9:30 at Peaine Township Hall. Euchre Thursday evening at Stoney at 7. Lego Club Saturday at the Library at 1. Also Saturday, two great feature films at the BIC Center: Bublebee is at 4, rated P-G 13. And at 7, it’s The Mule staring and directed by Clint Eastwood. It’s critically acclaimed. Rated R. Both movies on the big screen with the big sound in the McDOnough’s Market Theater. Concession stand will be open for both movies. Popcorn, pretzels, sweets, Nathan’s hotdogs with chips and pop from the soda fountain. If you are a boater interested in a seasonal slip at the municipal marina, it looks like there will be one available this year. If you are interested, the deadline to sign up for it is April 12. There are two applicants so far so a selection will be made by lottery. 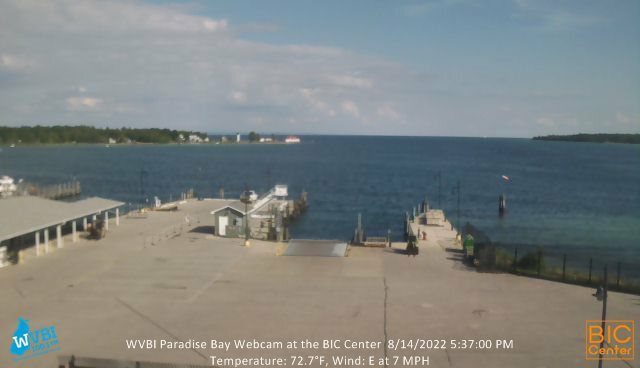 And, Beaver Island Marina has announced they are taking reservations for seasonal slips at their marina starting April 1. If you like boats and are looking for a job this summer, just about everyone is looking for you. McDonoughs, all the restaurants, the hardware and Island Airways all looking. Weather, here there and everywhere – presented every day with the support of the good folks down at McDonough’s Market: Today Widespread fog, mainly before 11am. Otherwise, mostly cloudy, with a high near 49. West wind 5 to 10 mph. Tonight Showers, mainly between 9pm and 3am. Patchy fog. Low around 35. North wind around 5 mph becoming east after midnight. Chance of precipitation is 100%. New precipitation amounts between a quarter and half of an inch possible. Tuesday A chance of rain showers before 10am, then a chance of rain and snow showers between 10am and 11am, then a chance of rain showers after 11am. Cloudy, with a steady temperature around 37. Northwest wind 5 to 10 mph. Chance of precipitation is 40%. Tuesday Night A chance of rain and snow showers before 9pm. Cloudy, then gradually becoming partly cloudy, with a low around 26. North wind 10 to 15 mph, with gusts as high as 25 mph. Chance of precipitation is 30%. Wednesday Mostly sunny, with a high near 38. Northeast wind around 10 mph. Wednesday Night A 30 percent chance of snow showers after 3am. Mostly cloudy, with a low around 28. TRAFFIC: No delays inbound or outbound to the airports, but roads down island are suffering from the thaw. So let’s be careful out there. Especially in the school zone. Time now for a look at Phyllis’s Facebook posts… ON THIS DATE Buddhists celebrate the commemoration of the birth of Gautama Buddha, the founder of Buddhism, thought to have lived in India from 563 B.C. to 483 B.C. According to Buddhism, there are “four noble truths”: (1) existence is suffering; (2) this suffering is caused by human craving; (3) there is a cessation of the suffering, which is nirvana; and (4) nirvana can be achieved, in this or future lives, though the “eightfold path” of right views, right resolve, right speech, right action, right livelihood, right effort, right mindfulness, and right concentration. Today, there are an estimated 350 million people in 100 nations who adhere to Buddhist beliefs and practices. DID YOU KNOW: it is illegal to hunt camels in the state of Arizona? WORD OF THE DAY: funemployed (fuhn-em-PLOID) which means without a paid job but enjoying the free time. Funemployed, an informal combination of fun and (un)employed, is a neologism dating to 1995. Birthdays: None on our list today, bit if we missed you on the list—Happy Birthday to you from all of us at W-V-B-I and Beaver Island Community Center. Did you know Kermit had a cameo on Star Trek? He was the captain’s frog. That’s the W-V-B-I Community Calendar for Monday, April 8th, 2019. I’m Kevin Boyle at the pest free Hogarth Pest Control Studios of the Voice of Beaver Island wishing you a great day and asking you: why not make it the best day ever? And, thanks for listening.